A Pāli and English line by line (interlinear) version of an important discourse in which the Buddha explains the path he took to Awakening, including his austere practices (with extensive annotation). BJT: Śrī Laṁkan edition, from the Buddha Jayanti Tripitaka Series, Volume X (Colombo, 1964/2508, reprinted with corrections 2005). The most reliable and the clearest edition. PTS: European edition, Majjhima-nikāya, Vol. I, (London 1888, reprinted Oxford, 1979). This edition is heavily abbreviated, over and above the normal peyyāla passages, and difficult to reconstruct. ChS: Burmese edition as found on the Chaṭṭha Saṅgāyana CD-ROM (version 3, Igaturi, no date but = 1999). Has all the normal problems associated with the Burmese texts, like spelling differences, and attempts to rectify what it feels is wrong metre. 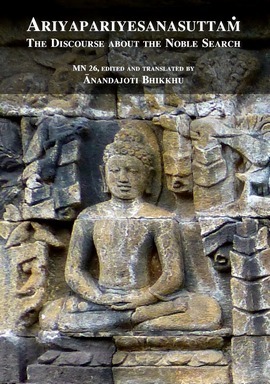 MLD: Middle Length Discourses of the Buddha, translated by Bhikkhu Ñāṇamoli and Bhikkhu Bodhi (2nd edition, Wisdom Publications, Somerville, 2001). A readable translation, but it is spoilt in places by being little more than an elliptic paraphrase, which glosses over many of the problems in the text. There are quite a lot of variant readings in this text, most of which are trivial, being variant spellings or forms, etc. but some of which are important for a correct understanding of the text. Some of the more trivial variants, like writing class nasal or niggahīta I have ignored, as these are orthographic, rather than true variations. With other readings, in line with my more recent practice on this site, I have tried to explain what the difference is between the form chosen and the variant, which is usually an alternative form, spelling or sandhi type. This will at least give some guidance as to what the alternative means.